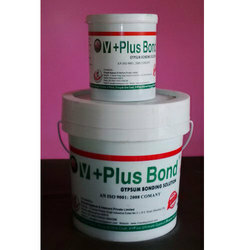 Prominent & Leading Manufacturer from Mumbai, we offer v plus gypsum bonding agent. BONDIT PLASTER BOND (+) is high strength bonding material for fixing gypsum plaster on concrete & other construction materials. Chemical Composition: Modified hybrid system. Film Characteristics: Flexible green waterproof coating. should be shut tightly to prevent contamination. If the material goes in the eyes, wash with water till burning stops or immediately visit doctor.